Interesting news from Market Watch – Given the size, population, resources, and level of technology development in the United States, the US solar market is believed to be the most underexploited in the world. The US solar market has experienced fantastic growth over the last five years. As part of the Emergency Economic Stabilization Act of 2008, the U.S. Investment Tax Credit provides another eight years extension for commercial and residential investments. Trends in solar thermal power revolve more around mandates and financing than technology, thus the ITC provides the necessary financial support to ensure the growth of this emerging technology. Within the solar market, solar thermal (concentrated solar power) installation is expected to surpass those of solar electric (photovoltaic). Research indicates that utilities firms are looking at solar thermal as the preferred alternative energy technology. Solar thermal energy presents a more cost-effective way to reduce dependence on fossil fuels and meets the renewal portfolio standards (RPS) that call for a certain percentage of renewable energy by a certain time. 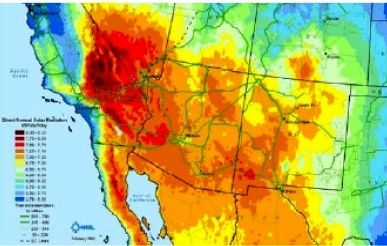 U.S. Southwest has the highest amount of sunshine and open land, resulting in numerous suitable sites for solar thermal power plants. According to Abengoa Solar, U.S. southwest can support over 11TW of solar thermal, which is enough to support a capacity of more than 6 times the current electrical demand in the United States. In the southwestern United States, the cost of electricity from CSP plants (including ITC) is about 13–17¢ per kilowatt-hour, meaning that CSP with thermal storage is competitive today with simple-cycle natural gas-fired power plants. The U.S.
Department of Energy aims to reduce CSP costs to 7–10¢ per kilowatt-hour by 2015 and to 5–7¢ per kilowatt-hour by 2020, making CSP a competitive alternative to fossil-fuel-based power sources.